Oppression in the food system. Oy, where do we begin and when will it end? Every sector of our food chain–from production, to processing, distribution, to retail and service–is laced with oppression, injustices, and flat out bigotry. Given that our nation’s food system was built on the backs of slaves using land violently stolen from indigenous peoples, racism is a founding institution of our food chain that continues to thrive today. The industrialization and corporatization of our food system has further concentrated power and wealth into the hands of the few and passed on the social and environmental externalities onto everybody else [Eric Holt Gimenez]. The results: gaping disparities in wages at every level of the hierarchical labor system, which disproportionately affects people of color. “The Illusion of Choice” masks the corporatization of food that places power into the hands of these few agencies. beyond wage gaps, mistreatment of the low-wage labor force is rampant. From withholding pay, to poor working conditions, and outright bigotry directed toward non-whites and non-citizens (migrant farmworkers), communities of color are subject to structural and symbolic violence on a daily basis. 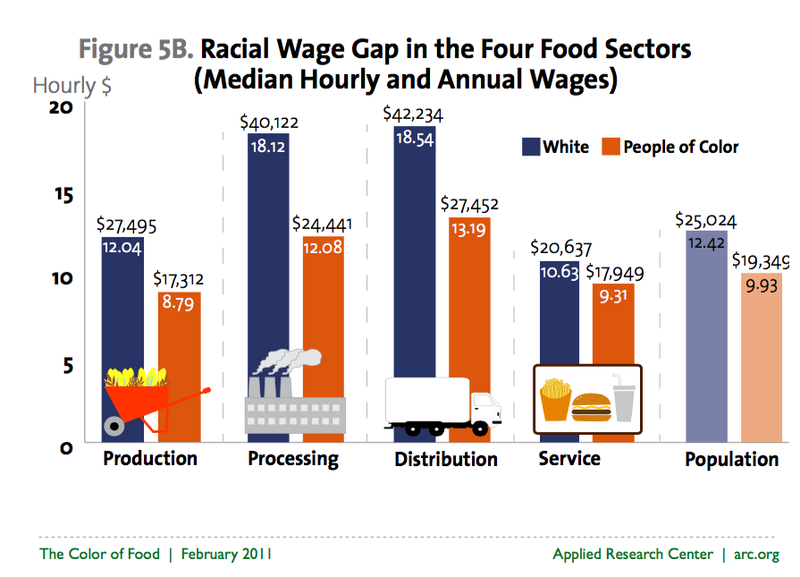 Research from Race Forward highlights the structural racial injustices within the food system. Download the entire “Good Food and Good Jobs for All” report. Escaping the system and finding liberation can be an insurmountable challenge given the constructs of oppression and devious connections between our global food system and policies that uphold a supremacist structure. We acknowledge that the ability to clock out requires an enormous amount of privilege that is not afforded to many marginalized groups. For that reason, we are always inspired when we meet folks who are actively and intentionally working to liberate themselves from the oppressive food system. Around Seattle, the inception of pop-up restaurants has been an incredible tool for folks of color to claim power in the food industry. By running their own business and building an enterprise through collective community efforts POC-run pop-up events hosted by Food & Sh*t, A DJ and a Cook, and our storyteller Def Chef, can do food on their terms and redefine what it means to work in the food system.